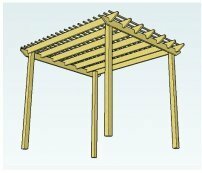 These free pergola plans will show you how to build a pergola. They are intended especially for beginners, with step-by-step instructions and easy to read diagrams. 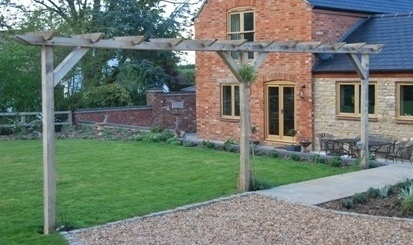 A pergola will make such a difference to your garden! 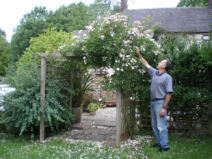 Use it as an arbour, a rose-covered walkway or beautiful patio pergola to give height, interest and beauty. Relaxing and entertaining is what it's all about! Keep the end goal in mind. 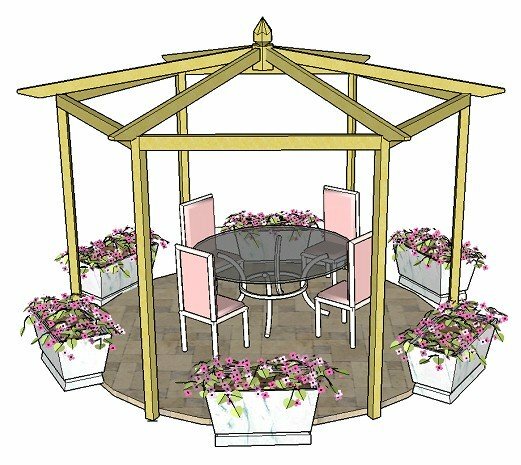 There are so many ways this pergola plan can be easily adapted to give style variations that will make your pergola a unique and stunning creation. It will be sure to suit your space perfectly. Use different sized wood for the pergola posts and rafters. Make your pergola longer or wider. Have the rafters in one direction only. Raise the rafters so they sit higher on the supports. Choose a curved rafter tail end. Use different methods of anchoring to the ground. You can do all of these things with the free pergola plans, and they will still work. Got to be a bonus! I constructed this pergola for a client, whose garden I was giving a make-over, and took the photo early on in the construction so that you could see the pergola structure clearly. This is used as the example in the free pergola plans because most pergola styles can be built from these plans, as it has rafters running in both directions. Your pergola may look completely different (see examples below) if you have decided on some modifications, but the plans still work whatever you choose to do! This one has been built with 3" posts and 4" x 1" flush fitting rafters. Because the rafters run in both directions it is often called a box pergola. Don't want rafters in both directions? Just leave them out. Like the look of rafters closer together? Not a problem. Want to use hardwood? That's fine too. Adapting the Plans shows you how to make all sorts of simple modifications, from the type of fixings you use to attach the pergola to the ground, to knowing which way to have the rafters running depending on the size of your pergola. Sandra wanted plain rafter tails (those are the bits sticking out on the top) but you could have a more elaborate design if you wished. 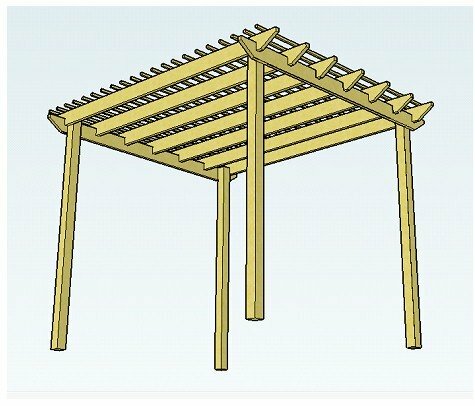 There are 18 different rafter tail design templates to choose from, and are just one of the ways in which you can make this pergola an individual and unique garden structure. Trellis has been added at the sides to give extra support for the climbing plants, and to make the patio area more private. During pergola construction. Three pergolas of different dimensions, joined with trellis, make this area into a secluded patio. And here it is, in all its glory! All finished and clothed in wonderful climbing plants. A gorgeous purple clematis trails through the rafters. A perfect companion to the pink rambler rose. Here are some more pergola pictures of the patio area from the inside and the outside. 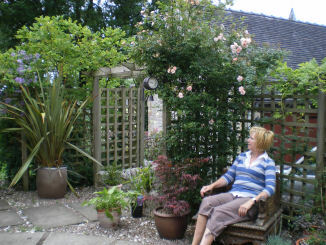 The second pergola supports a long-flowering rambler rose. A hanging garden clock, fabulous garden furniture and planters enhance the effect. The third pergola is much narrower, leading to the house. 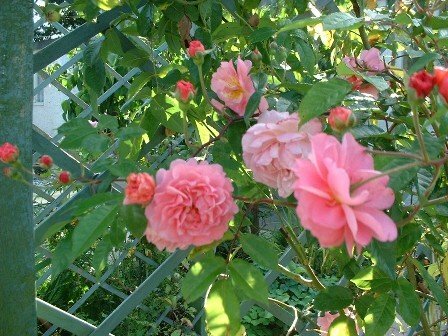 Another rambler rose covers the adjoining trellis with beautiful deep pink flowers. 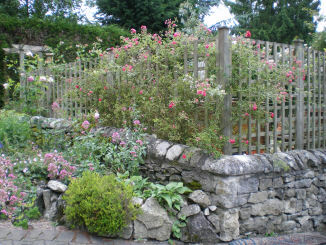 A view from the other side, showing the vigorous nature of the rambler rose. 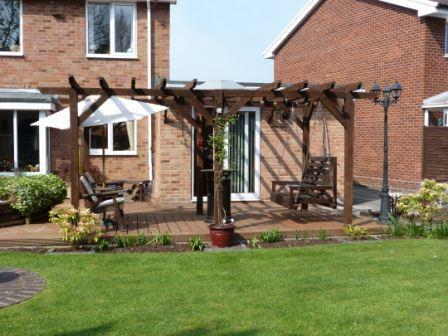 This pergola was adapted from the free plans. I've included it here to show how the plans can be modified to give a completely different effect. It has been drawn to scale, having 4" posts and 6" x 1.5" raised rafters. Purlins have been added on top of the rafters, giving more shade and a decorative effect. This pergola design could be made twice, or even three times, as long (more if you wished), creating a long walkway, or even a lean-to patio pergola running the length of your house. This pergola arch joins two parts of the garden. It could easily be made into a seated arbour. Need to separate two areas? 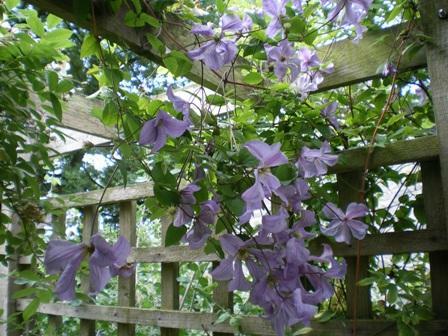 This pergola could also have trellis attached on which to grow wonderful climbing plants . Stand your pergola on decking to create a fabulous outdoor room. Ideal for relaxing and entertaining! "What you have on this site is so great! Thank you!" A DIY pergola can be great fun and very rewarding to build. Remember, these downloadable pergola plans are intended for beginners. When you read through them, you might think that because there are several pages long they must be complicated. The opposite is true. By including every small detail, hopefully there will be less steam coming out of your ears and more appreciation of your newly found talent! Look through the pergola plan, get a general feel and understanding for the process, see if you want to make any modifications, and then follow the instructions about finding tools and materials. 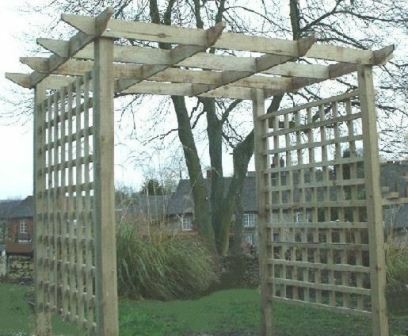 This freestanding wooden pergola is fairly straightforward to build. I have built many of them from this design - and they are all still standing, and are very beautiful, clothed in scented and colourful climbing plants. Have a go - you might surprise yourself! "Finally finished the pergola after only weekends and a few evenings. The plans were very useful. I modified them quite a bit to fit in with my deck. Thanks once again for very informative plans to work from." You will need Adobe Reader (the latest version is recommended) installed on your computer in order to open and read the free pergola plans. It's a simple process and it's free! Many websites use it now so it will come in handy for the future. When you have downloaded Adobe Reader, if you want to open the file in your browser window, you can just click on the link at the bottom of this page. However if you want to download the file to view later, then right click on the link and choose "Save Target As" or "Save File As." Then select where you want to save the file on your hard drive. It's easy to do. Just fill in your name and email address in the form below and you will be able to download the Free Pergola Plans immediately. Check your inbox for the email that contains the download link and password. If you can't find it, please check your junk/spam folder. 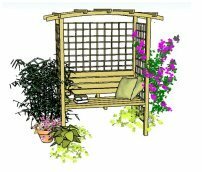 "Loved the gazebo ideas in your Ezine, but my husband built a beautiful pergola using your plans last year and we can't fit any more hard landscaping in our small garden!" Subscribe to 'Love Gardening' and Get Your Free Plans Now! The Raised Bed Plans to use as a simple pergola planter. 'Love Gardening! 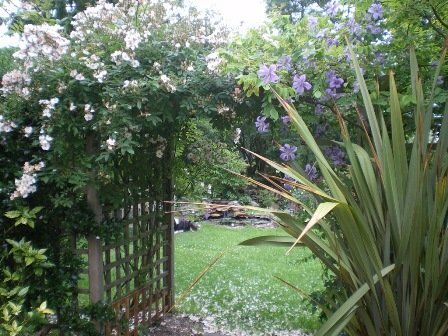 ', my ezine publication, which keeps you informed of offers and exclusive voucher codes on a whole range of gardening products, updates to the website, hints and tips on gardening, landscaping, garden design and makeovers, planting...in fact, all things to make our gardens fantastic places to relax and unwind! 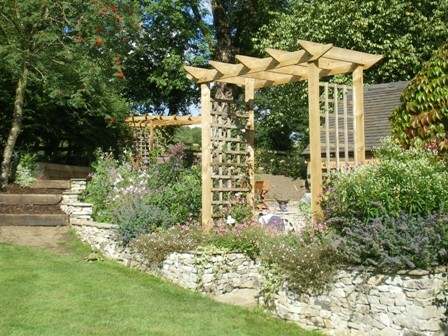 There is so much you can do to make your pergola a really special feature, adding height and interest to your garden. Find further ideas on where to place your pergola here. If you do build one from the free pergola plans, we would all love to see a picture, or hear your story! Help inspire others to have a go. Upload a picture and write about your pergola building experience. Have your own page on this website. It's very easy to do! Here's to your fantastic new pergola!